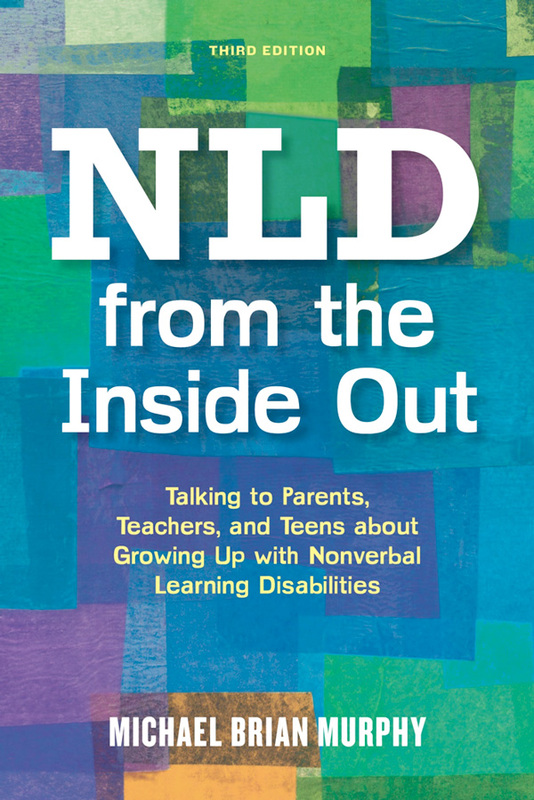 Written by and for teens and young adults with Nonverbal Learning Disabilities (NLD) – and their parents, teachers, and therapists – this expanded new edition of NLD from the Inside Out presents useful tips, strategies, and insights into living with this oft-misunderstood disability – in the voices of those who experience it. This book will help teens and young adults to avoid the angst and pitfalls often associated with NLD. More than that, it offers real stories from now-thriving young adults who grew up with NLD – proof that a full and rewarding life lies ahead for those who are now struggling. Click here to download pages 19-39 of NLD from the Inside Out. NLD from the Inside Out fully explains Nonverbal Learning Disability to anyone who has that diagnosis or who wants to understand it better. Michael Brian Murphy offers practical advice and strategies for school, relationships, and life after graduation. He writes with an authentic voice about a diagnosis that he shares with many other teens and adults. This inside look at NLD contains wisdom, clarity, and humor that will inspire those with NLD, as well as parents, teachers, and therapists. Of all the valuable information to be found in this work, as a therapist, I particularly recommend the chapter on ‘What we want therapists and counsellors to know.’ If you have NLD or know someone who is seeking support from a therapist, you will find it worthwhile to follow Murphy’s suggestions and caveats. It is essential that the therapist to whom you turn be exceptionally knowledgeable about the disorder and be competent to provide the guidance that will help you overcome the distresses this disorder may cause you. This book will be an eye-opener for teachers, parents, and other interested readers. No doubt many will realize, “Ahhh, now I understand…” and, hopefully, that understanding will contribute to the success of children and adults with NLD. It’s also a valuable resource for young people with NLD: real-life voices, experiences, and common sense. As the parent of an adult child with disabilities, I’ve learned that the true experts in the field are people with disabilities; Mr. Murphy’s book ably demonstrates that fact. Bravo!